Click here for a pop out player of the playlist. 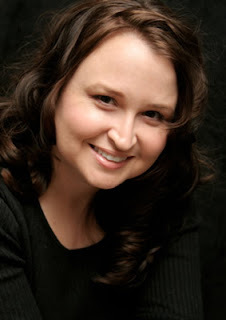 About the Author: Lani Woodland has been an avid reader since elementary school when she first discovered the Babysitters Club and Sweet Valley Twins series. In sixth grade she began writing plays and recruiting (with force when necessary) her friends to act them out. Most of these early works were inspired by She-Ra, the epitome of girl power to her young self. She graduated from BYU with a BS in Family Science. Lani has always loved scary stories, and has a hard time enjoying any book without at least a little romance in it. She lives in Southern California with her husband, their two children and a large collection of board games. She has worked as a spot-welder, babysitter, janitor, photographer, gymnastics coach, and movie extra. She enjoys bonfires at the beach, hole-in-the-wall restaurants, speed talking, chocolate as a cure-all, and the word “precisely”. 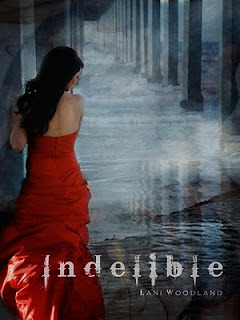 The Giveaway: As part of the blog tour we are giving away one advanced reading copy of Indelible to our readers. It has been read by us as reviewers (so has minor shelf wear) but we wanted to pass it on to you, our loyal followers. To enter to win, simply comment below. Open Internationally and ends October 9, 2011. Summary: Sixteen-year-old Yara Silva has always known that ghosts walk alongside the living. Her grandma, like the other females in her family, is a Waker, someone who can see and communicate with ghosts. Yara grew up watching her grandmother taunted and scorned for this unusual ability and doesn’t want that to be her future. She has been dreading the day when she too would see ghosts, and is relieved that the usually dominant Waker gene seems to have skipped her, letting her live a normal teenage life. However, all that changes for Yara on her first day at her elite boarding school when she discovers the gene was only lying dormant. She witnesses a dark mist attack Brent, a handsome fellow student, and rushes to his rescue. Her act of heroism draws the mist’s attention, and the dark spirit begins stalking her. Yara finds herself entrenched in a sixty-year-old curse that haunts the school, threatening not only her life, but the lives of her closest friends as well. Yara soon realizes that the past she was trying to put behind her isn’t going to go quietly. Lani Woodland has been an avid reader since elementary school when she first discovered the Babysitters Club and Sweet Valley Twins series. In sixth grade she began writing plays and recruiting (with force when necessary) her friends to act them out. Most of these early works were inspired by She-Ra, the epitome of girl power to her young self. over me as we were there. That moment of feeling watched and creeped out is where the first idea for Intrinsical was formed. What books have inspired you and who are your favorite authors? Almost every book I’ve read has inspired me. I can usually find something in it I liked and take away with me. My list of favorite authors is huge and varied. I read a little bit of everything (mysteries, paranormal, fantasy, urban fantasy, romance, classics and historical) so I have authors in almost every category that I love. How did you choose Brasil as the setting for your book? I chose Brazil to be part of Yara’s heritage because my husband lived there for a while and loved it. I wanted her to have an interesting background and I could just picture her grandmother in the places my husband described, so I thought it would be cool to have Yara’s father be from Brazil. three main characters. She thought he was too confusing. If I could, then she would be interested in reading more. I had no idea how I was going to do that but I said yes. Then I brainstormed with my friends and came up with a way to make that happen. The agent didn’t end up offering representation but her one suggestion was the catalyst for a major revision and helped improve the whole story. Also for Intrinsical there were many times when I was tempted to give up but kept working on it and submitting until it was picked up. Have you taken any retreats or paranormal trips lately? In the past, I visited the Queen Mary and the Whaley House in San Diego, both rumored to be haunted, but that was several years ago. Both were fun to visit and creepy! A Waker is someone who can see and communicate with ghosts. There are different levels of Wakerness. Some Wakers, really strong ones, develop other abilities, as well. I’m currently working on the next book in the Intrinsical series. I’m also working on another YA series and just submitted two stories to an anthology. 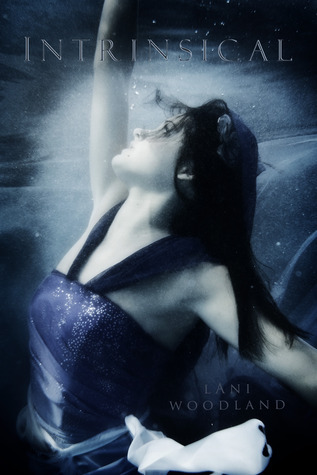 As a giveaway, author Lani Woodland has offered to write YOUR NAME into the sequel for Intrinsical. This contest is international and ends Decmber 15, 2010. Enter here for a chance at your name in print!